Tia was one of those “once in a lifetime dog”! I can not thank Marjorie Moore enough for allowing us to have Tia. Tia was a wonderful dog from the day she came home to live with us. 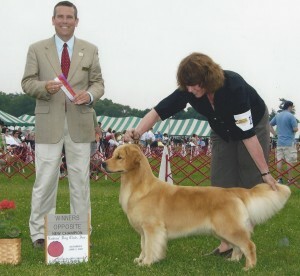 Tia finished her American championship in a dozen shows, all owner/handled. Along the way she won back to back majors, numerous golden specialty sweepstakes and best puppy at her first specialty show. Tia was such a happy, full of life golden retriever! Sadly, June 2016, Tia passed away.